10 EASY Things You Can Do with Essential Oils Right Now! Along my journey of becoming more healthy, sustainable, non-toxic, and happier, it’s only natural that I would bump into essential oils. I used to think they were only for hippies to rub on themselves in lieu of deodorant or for chemists to putter with. I think my very first essential oil I ever got was tea tree. For acne. That was a looooooong time ago in my adolescent years when I would have tried anything to cure my woes! Can you relate? Fast forward 17 or so years, I’m dating myself here, I know; and I find myself on a very different path, but thankfully one that has still included essential oils. Be forewarned though, essential oils can be powerful and potent little potions, so don’t fumble blindly into the world of EO like I did… do some research. Luckily, I did some for you, and found a great resource for beginners. Today, because Sweet Baby really wants to play, the dog really needs a bath, and, I should probably shower before DH gets home, I am going to let Lea over at Nourishing Treasures give you Essential Oil 101. Not only does she provide an excellent resource for learning about EO, but she also made a pdf file so her research can easily be printed as a quick reference! She is embarking on some great work right now of 3rd-party purity testing (in a lab with a chemist and a Gas Chromatograph/Mass Spectroscope) of various oils, and I can’t wait to see what is found! They will test some of my favorite brands, so I hope the results are favorable. (That’s the thing about EO, they are often adulterated and it extremely hard to know what you’re getting–even from your most trusted sources). As part of your facial cleansing ritual, wet a wash cloth with the hottest water you can stand, and apply 1 drop of your favorite oil to the cloth. I usually use lavender to soothe, but also enjoy lemon balm for extra tense days, or peppermint for a pick-me-up. Rose geranium is also a favorite of mine. I love anything rose, and if I was rich I would buy pure rose essential oil… but I’m not rich, so… bummer. Alternatively, a few drops of EO on a cotton ball hidden in inconspicuous places around the bathroom will scent it as well. This method may also be used for cupboards, drawers, and any place else you might need/want a refreshing scent. Bring a pot of water to a boil on the stove and include a few drops of EO for an easy diffuser. I do this a lot in the winter because the added humidity in the air inside the house makes us all feel better. Place a few drops onto your dog’s collar. Particularly flea repelling oils such as tea tree or cedar. Place a few drops of EO onto a small piece of cloth and toss in your dryer as dryer sheet instead of those nasty, chemical-laden pieces of garbage. A few drops of EO added to the hot wax of a tea light makes an easy scented candle. A few drops of EO added to your bath water makes for a soothing respite from the day. Just be sure to lock the door. Using EO is as simple as adding it to a cotton ball and keeping it near by to sniff. Therapeutic uses often help with stress, anxiety, nausea, energy levels, even labor pains. I personally relied heavily on the the scent of lemon balm, (or melissa), to help me through the anxious early days, (OK, who am I kidding– weeks), of new-Motherhood. Just a bit of my oil stash! What are some of your favorite oils? Let’s chat in the comments below! Cinnamon essential oil can cause burns and should not be touched directly until diluted, no? That is absolutely true! And, if you were to come in contact with an oil like that that burned the skin, do not wash with water. Cover it with a large dose of any heavy oil you have on hand like olive or canola. A large majority of essential oils should be used with a carrier oil when applied topically. You can use EO of Orange for clearing your thoughts for better learning. A lot of my teachers use Orange in their classrooms to help their students learn plus the kids LOVE it. EO of Mandarin is often used for restfully sleeping (just like Lavender). I use to keep a rag under each sink (kitchen and bath) with Lemon oil for the glass in the shower and stainless in kitchen~works like RainX and repels water for no spots. Just a few I have learned along the way. Love your site! Jeni, I’m so glad you like it! I love essential oils! And you are so right in that there are so many uses for them!! Nice post! I read somewhere that mice don’t like the smell of cloves. We had a problem with mice squeezing past the pipes under our sinks to get in the house. 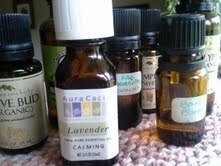 So, I put a cotton ball next to these favorite spots under the sinks and every few weeks I add a drop of clove EO. Well, either the mice mysteriously lost interest in the house, or it works. Haven’t had mouse problems in months (knock on wood). That’s awesome!!!! What a great tip 🙂 Thanks for sharing, Rae! I found you on/in ‘The Wonderful World of Pinterest’…..I’m lovin your blog lil girl 😉 KEEP UP THE GOOD WORK! I own 43 single EO’s and LOVE making our own; deodorant, face scrub, face moisturizer, salves, rubs, blends, cleaners, laundry soap, dish washer soap, etc. We are originally from NE Idaho, have lived in WA, vacation for a month at a time on the OR coast every other year, and now live in TX. Our dream/goal is to move back to the North West Coast area in 4 yrs, after our ‘baby’ graduates from high school, and be homesteaders. WE LOVE THE SIMPLE LIFE! Thank you for your very lovely comment! You’ve made my day 🙂 I hope you do follow your dream all the way back to the PNW! It’s such a wonderful place to live and homestead. My dream is to be an urban farmer, and we are working hard at it. We just got some baby chicks! Where did you live in WA? Yeah, we weren’t fans either. We had moved there, into a VERY small apartment with 4 small kids, from a good sized house we rented out in the country. I grew up on a farm and we had a CrAzY HUGE garden and the hubster was a city boy, but they had a good sized garden. Here in TX we live on 1.22 acres, but the soil is really heavy clay. The very few people that have a garden had to have top soil trucked in. We go to the farmers market here, but it’s just not the same as the ones out West :-(. The hubster put in for a job in Olympia yrs ago. We really wanted to live in that area at the time! AND Walla Walla is awesome! We were there for 2 wks while hubby did some business for work when the kids were very young. We loved the college area with all the cool looking houses! The hubster and I both grew up in the same area in ID….Him in town and me out in the country. We were in between Jackson Hole and West Yellowstone…..both were just 1.5 hrs away. ALL SIX OF US MISS THE MOUNTAINS SO MUCH. It was great to meet you and I wish you the best! My favorite oil – well when I think of scent – is lemongrass. I accidentally spilled a little, okay, a lot, in my “lab” area last summer, and wiped it up with toilet paper. That toilet paper stayed scented with lovely lemongrass for weeks. I even gave a stretch of it to my friend who kept it in her backpack, which she takes everywhere and probably really benefitted from the fresh aroma! Looks like you’ll have to put the peppermint oil on tp for the mice. What a great accidental discovery 🙂 I wonder why it works better than the cotton ball? Thanks for sharing your tip! Stumbled upon your blog tonight. I love putting a few drops of Lemon essential oil on our vacuum filter. I do it all the time! Makes the house smell so nice.